It is a great pleasure to be back at the "Young Icebreakers" anniversary dinner. This is the ninth time that I am celebrating your anniversary with you during my eight years as Chinese Ambassador to the UK. I have seen with my own eyes how "Young Icebreakers" have grown from strength to strength in the past ten years! To quote a Chinese idiom, "a good sword deserves ten years' honing". On the occasion of your tenth anniversary, let me extend to you my heartfelt congratulations. 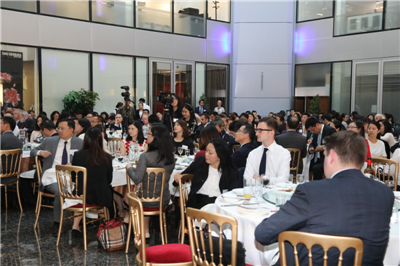 I also want to thank you all for your contribution to China-UK exchange and cooperation. Sixty-five years ago, the 48 Group broke the hard ice of western embargo against China and started the flow of trade between China and the UK. That is how they have come to be known as the "Icebreakers". The first decade of the 21st century saw the birth of the "Young Icebreakers", who have been given the mission to carry forward and renew the "Icebreakers" spirit. Do we still need the "Icebreakers" spirit? What "hard ice" is there to break? How can we break it and move forward? Let me share with you some of my thoughts. The world today is undergoing profound changes unseen in centuries. Peace and development remain the theme of the time. But the world is far from being peaceful. Unilateralism is on the rise. Uncertainties and destabilising factors are increasing. Trade protectionism is becoming a weapon in the hands of a certain country to provoke trade dispute that put the global economy at risk. The first is that international relationship is a "zero-sum game" where one country's gain is another's loss. The second is that a country may put itself above international trade rules. The third is that the "Cold War" mentality and ideological bigotry is still prevalent in the world today. These are the "hard ice" that we must break. Then, how do we break these "hard ice"? How can we move forward towards a prosperous future? I believe that the answers can be found in how China has achieved development. That is China's solution. The first answer is inclusive cooperation. This is how China has achieved development. Our history tells us that openness brings progress, whereas isolation leads to backwardness. This year marks the 40th anniversary of China's reform and opening-up. In 40 years time, China has achieved a transition form seclusion and semi-seclusion to all-round openness and deep integration in the global economy. the largest overseas investor and host of foreign investments. Looking ahead, China will continue to build up its opening-up layout. The western parts of China will become more open. Free trade zones will make further progress. The opening of free trade ports will be explored. These will facilitate all-round opening-up by linking east and west, and connecting the land and the sea. Recently, China announced a succession of tariff cuts on cars and consumer goods. This involves over one thousand product lines and fully demonstrated China's firm resolve to open up further. In the words of President Xi, China's door of opening-up will not be closed and will only open even wider. The second answer to how to break the ice is mutual benefit. The ancient Chinese wisdom has it that "to establish oneself, help others establish themselves; to achieve success, help others succeed." The moral is, always seek mutual benefit. One flower does not make spring. China believes in mutual benefit. That is why China joined the World Trade Organisation, founded the Asian Infrastructure Investment Bank, and put forward the Belt and Road Initiative. In this process, China has made important contribution to the sustainable development of the global economy. This has been particularly true in the aftermath of the international financial crisis of 2008. China has maintained mid-high growth rate, contributed over 30% to world economic growth for years in a row, and become an engine for global recovery. Today, China is leading a world trend with its new four great inventions, namely high-speed rail, e-commerce, mobile payment and bike sharing. These could provide new driving force for global economic growth. China also invites every country to board the "fast train" and share the benefit of China's development, and to stay committed to openness, connectivity, cooperation and mutual benefit. To this end, China will host its first-ever International Import Expo in Shanghai in November. We welcome the participation of international businesses, including British companies. This will be a great opportunity to take a share of the Chinese market and benefit from China's development. The third answer to how to break the ice is assuming the responsibility of a major stakeholder. China is ready to embrace the world. We believe that "a partnership forged with the right approach defies geographical distance". No country can achieve development in self-isolation; No country can alone address the many challenges facing mankind. The world is already a community with a shared future, where interests are intertwined and countries are deeply interdependent. This is the backdrop of the Belt and Road Initiative that China has proposed and has been actively promoting. This Initiative is open, transparent and inclusive. It follows the principles of extensive consultation, joint contribution and shared benefit. It will respect the law of the market and international rules. And it is a new platform, a new mechanism and a new format for open economic cooperation. The Belt and Road Initiative will surely bring concrete benefit to all those who are ready to play a part in it. Despite the geographical distance, cultural gap and political differences between China and the UK, our two countries have established diplomatic relations and elevated their ties to first comprehensive partnership, then comprehensive strategic partnership and now global comprehensive partnership for the 21st century. This has been a journey of continuous icebreaking. There is a great deal we can learn from this ice-breaking journey in which China-UK relations made huge progress. I would like to use three A's to sum up this valuable experience. The first A is aiming high. This means adhering to the strategic direction of China-UK relations. In China-UK high-level exchanges, the leaders of our two countries have always had in mind the over-arching trend in the world and the big picture of the international situation. That is how they agreed on the strategic definition of and charted the course for China-UK relations. In 2015, President Xi Jinping paid a successful state visit to the UK and started the "Golden Era" of China-UK relations. Prime Minister May's visit to China early this year was also successful. The leaders of our two countries agreed to bring the China-UK "Golden Era" up to date by building a more strategic, practical, global and inclusive relationship. This has rolled out a new blue print for inclusive cooperation between China and the UK. The second A is audacity. This means daring to be open and innovative. The first to sign with China the Joint Strategy for Science, Technology and Innovation Cooperation. 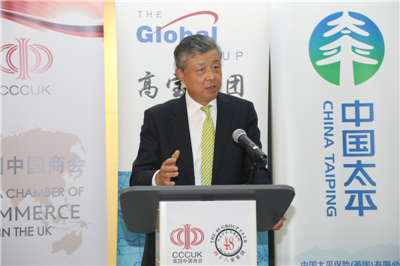 China and the UK have also worked together in upholding inclusive cooperation in the international arena. We are both opposed to trade protectionism and uphold the multilateral trade regime. We both advocate international trade and investment liberalisation and facilitation. We are both committed to building an open world economy. The third A is agree to disagree. This means mutual respect. It is natural for China and the UK to disagree on some issues due to our differences in history, culture, social system and value. But we have managed to enhance mutual trust, reduce differences and seek common ground through dialogues on the basis of equality and mutual respect. This is, in my view, the premise and foundation of a sound and stable China-UK relationship. Young people are the future of a nation. You are also the future of China-UK relations. 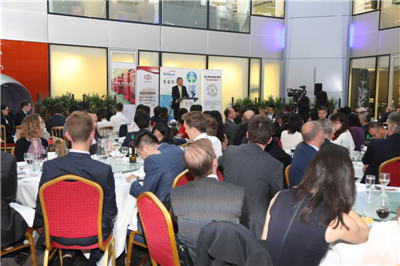 I hope the "Young Icebreakers" will carry forward the "icebreaking" spirit and advocate open cooperation between China and the UK, and indeed cooperation between all the countries in the world. First, I hope you will keep cool and carry on in face of vicissitudes. To see the complicated and changing world in its true light, one must learn the laws of history in order to dispel the clouds and let the sun's beam shine through. The past and present have told us that we are living in an interdependent global village. Here, openness brings progress and cooperation leads to win-win results. I hope our young icebreakers will keep your eyes on the long-term and strive for common prosperity through inclusive cooperation. Second, I hope you will be persevering in your endeavour. Every big thing starts with something small. Every long journey begins with a single step. Inclusive cooperation is a massive endeavour. Partners in cooperation need to identify their converging interest, take solid steps in every project and remove every obstacle in order to build the grand edifice of common development brick by brick. China and the UK are natural partners in development. We have highly complimentary economies and huge potential for cooperation. I urge our young icebreakers to get down to business and be innovative. The opportunities for China-UK cooperation in financial services, energy, artificial intelligence and digital economy are out there for you to explore. 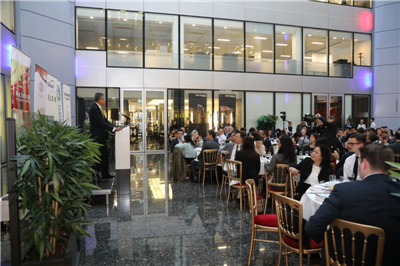 Your efforts could not only add building blocks to China-UK cooperation but also pave the way for global economic growth. Third, I hope you will be inclusive and think beyond narrow self-interest. "Boundless is the ocean where we sail with favourable wind." China and the UK are major countries with international influence. The cooperation between our two countries has a global impact. Both countries have the responsibility to do more for the economic prosperity and stability in the world. Both have the duty to adhere to free trade and to push for more vigorous, more inclusive and more sustainable economic globalization. I urge our young icebreakers to actively participate in the cooperation on the "Belt and Road" Initiative and stay true to the principles of extensive consultation, joint contribution and shared benefit. This will enable more countries to taste the fruit of China-UK cooperation. It will allow more people to share the benefit of economic globalization. This will be your contribution to the building of a community with a shared future for mankind. Youth is the flower of life. Young people are the most passionate, the most daring and the most high-hearted. I hope, from the bottom of my heart, that the 48 Group Club and the "Young Icebreakers" will carry forward the "icebreakers" spirit, raise the sail towards open and win-win cooperation and break the ice to move forward. I am sure you will contribute your wisdom and energy towards the building of a community with a shared future for mankind. You will make our world a better and more beautiful place.